A trip for tea to Elys in Wimbledon (much more exciting that Starbucks or Coffee Republic and with water, unlike all of Wimbledon Village) yielded a bit of a surprise and a disappointment for anyone who’d been pinning their hopes on getting into what is clearly an exclusive bash. Tea parties when I was a kid were teddy bears (cuddly) or chimps (funny – at least as long as they’re kept at a distance). 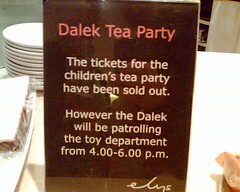 I think I would have had trouble keeping my tea and buns down if a Dalek had turned up. I mean, I once saw Tom Baker at a book-signing in the 70s and a toddler had hysterics because there was Dr Who – he was real and not a puppet who lived in the telly. I just hope they have paramedics on call and have made sure the emergency exits are fully operational. I also wondered how big the Dalek actually was, because the aisles were a bit of a squeeze as it was.